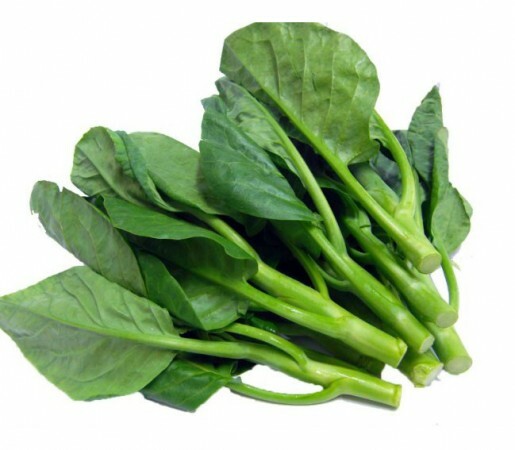 Kai-lan is the Cantonese name for a vegetable that is also known as Chinese broccoli or Chinese kale. It is a leaf vegetable featuring thick, flat, glossy blue-green leaves with thick stems and a small number of tiny flower heads similar to those of broccoli. Its flavour is very similar to that of broccoli, but slightly more bitter. It is also noticeably stronger. Kai-lan is eaten widely in Chinese cuisine, Common preparations include kai-lan stir-fried with ginger and garlic, and boiled or steamed and served with oyster sauce. It is also common in Vietnamese cuisine, Myanmar and Thai cuisine. Kai-lan can be sown in late summer for early-winter harvesting. Seedlings planted in autumn will last all winter.